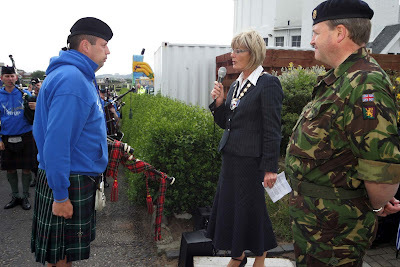 THE British Army’s Scotland-wide Pipers’ Trail filled Ayr town centre with the sound of bagpipes after South Ayrshire Council Provost Winifred Sloan (pictured below) officially gave permission for a procession of Army and local pipers to march through the town. 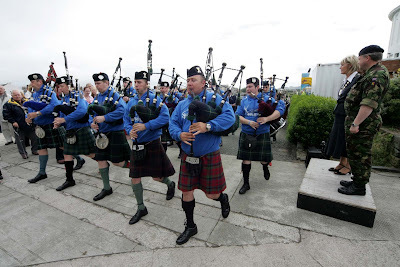 The Pipers’ Trail is a unique musical journey that has been taking place across Scotland this summer covering a total distance of approximately 470 miles. 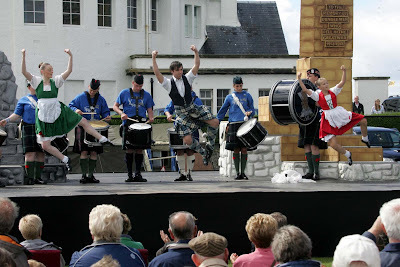 The Army in Scotland organised the event in conjunction with the Royal Scottish Pipe Band Association. As part of their visit, a special church service was held within the Auld Kirk of Ayr to acknowledge the contribution that Army personnel make to local communities and communities around the globe. 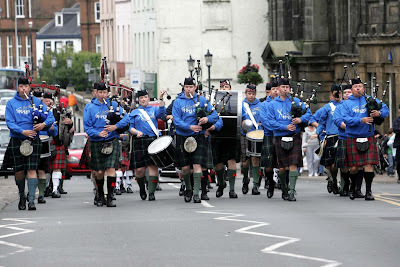 In the four days leading up to the march, piping and drumming workshops run by the Army School of Bagpipe Music and Highland Drumming and the Royal Scottish Pipe Band Association where held in Ayr Town Hall. The workshops attended by people just starting to play the bagpipes and pipers who wanted to develop their piping or drumming skills. After the march around Ayr participants made their way to a free event on the Low Green where a range of activities had been organised for everyone to join in and enjoy. 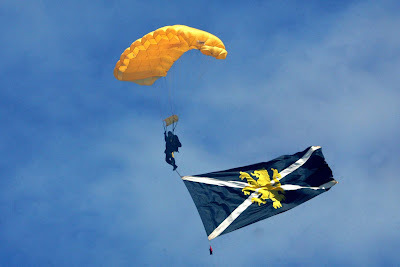 There was a selection of army vehicles to see, a performance of a specially commissioned Pipers’ Trail play, an army field kitchen, face painting for children, and as a spectacular finale the Gold Lions Parachute Display team brought the afternoon’s festivities to a close by dropping onto the Low Green (pictured below). Provost Sloan hosted a Civic Reception within the County Buildings to mark the occasion and presented Colonel Angus Taverner with a statuette of a piper as a memento of the Army’s visit to Ayr. 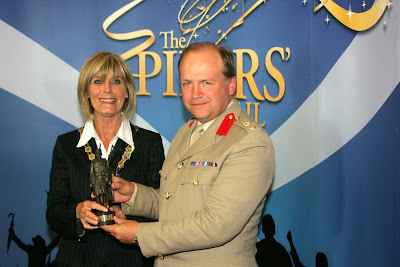 Provost Sloan said: “Ayr has strong military connections and I am very pleased that they selected Ayr to take part in the Pipers’ Trail. The Army plays an active role in communities across Scotland and I would like to thank them for the tremendous effort that they put into this event. “Many of us have family, friends or colleagues who have either served or are serving in the regular Army or the Territorial Army, and I would like to thank them for their commitment and selfless loyalty they show to the Army and to their country. At the Civic Reception Lord Lieutenant for Ayrshire & Arran John L Duncan presented a Lord Lieutenant’s Certificate to Staff Sergeant Stewart McKenzie Finlay for his service to the Territorial Army Staff. 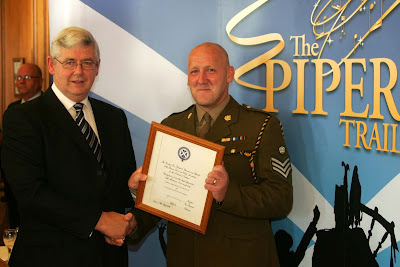 Speaking about the presentation John Duncan said: “Staff Sergeant Findlay exemplifies all that is good in the modern Territorial Army and it has given me the greatest pleasure to recognise his service with a Lord Lieutenant’s Certificate. It is a recognition richly deserved. 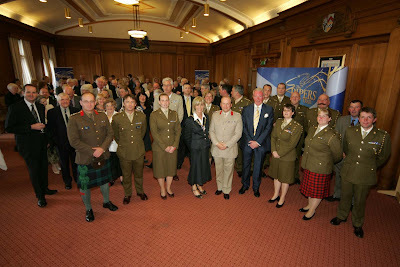 The Pipers’ Trail visit to Ayr and the Civic Reception further cemented relations between Ayr and the Army. 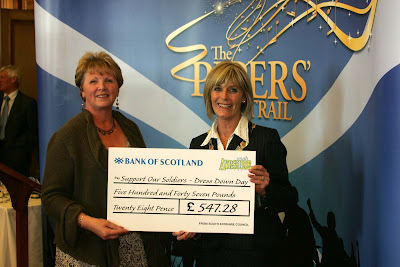 Colonel Angus Taverner said: “The Army in Scotland is delighted to bring The Pipers Trail to Ayr. Not only is this an important opportunity to celebrate the Territorial Army’s centenary with the town, and to mark Ayr's remarkable contribution to volunteer service over the past 100 years, but it also gives us the opportunity to share directly in this very significant anniversary. There are currently 299 Ayrshire business stories permanently archived on this site. To locate those of most interest to you, please use the site search facility in the top left hand corner of this page. Type your search term in the white box, then click “SEARCH BLOG”.